Jack’s Mannequin is something of a cathartic vessel for Andrew McMahon, the vibrant front man of the recently reconciled piano-rock band Something Corporate. From Everything in Transit’s flourishing, sunny beach pop to the more delicate and intimate recollections of his battle with leukemia found on The Glass Passenger, there has always been a sense of emotional proximity present within each of his albums. Whether the thought he portrays is one that we all encounter, like a broken heart, or one that we hope we never have to endure, such as cancer, McMahon has a knack for reaching his audience with minimal obstruction. The hefty following that has amassed due to his extraordinarily relatable style is now one that McMahon must aim to please, and considering how popular both of his records were under the name “Jack’s Mannequin”, that is no straightforward task. While diehard fans of Everything in Transit will hope for a return to the breezy, carefree approach of yore, those who sunk their teeth into The Glass Passenger’s maturity will be equally watchful for another ‘Swim.’ But just like he always has in the past, Andrew McMahon has once again come up with a fitting solution: the mature, energetic, and honest-as-ever People and Things. Jack’s Mannequin gets the ball rolling quickly with ‘My Racing Thoughts’, a percussion-driven track that slides by effortlessly to a synth background and nearly flawless vocals. The song’s upbeat qualities are tangible and make for a compelling first single, while simultaneously giving us a taste of what to expect from the entire album. People and Things is a record that thrives on tempo, and as any avid Jack’s Mannequin fan could probably already tell you, that is something that Andrew McMahon is an expert at crafting from right in front of his piano. The smooth tumbles and rolls of piano notes in ‘Amelia Jean’ just might bring that strength to life the best, illustrating his ability to dictate the pace of an entire song with nothing but his nimble fingers. To be honest, McMahon’s talents on piano rarely go unnoticed here. ‘Release Me’, ‘Hey Hey Hey (We’re All Gonna Die)’, and ‘People Running’ are all extremely memorable mid-tempo offerings that succeed because of the songs’ piano-based nature and each one’s ability to incorporate poignant lyrics that match the instrumental tone. But it isn’t like Jack’s Mannequin is lulling us to sleep here with endless fluttering notes, seeing as there are plenty of electric guitar jolts here, occasional electronic effects there (see the introduction to ‘Television’), and drumming that keeps up with everything McMahon was able to concoct in the studio. The result is another piano-rock album in the vein of Something Corporate with the lyrical maturity of The Glass Passenger and the fun elements of Everything In Transit...and for all of its diverse elements, People and Things just might be McMahon’s most cohesive work yet. If there is an area that Jack’s Mannequin’s newest album falls short, it is in its stationary innovative progress. People and Things could be viewed as a microcosm of the band’s discography, and as such, it sounds and flows like a collective reworking of their best traits. While it guarantees results for long-time fans (which for all we know may be McMahon’s top priority, and respectably so), it doesn’t attract the kind of attention needed to spark a fresh interest in Jack’s Mannequin. Anything on this record can be found on one of the band’s prior endeavors, even if the package that it is now being brought to us in has altered its appearance. For the nostalgic, it makes for a fulfilling listen; for most, it is still quite satisfying. However, if you are looking for the kind of thrill delivered by the uniqueness and sheer novelty of McMahon’s earliest works with this side project, People and Things may leave you wanting a little more. Nevertheless, complaints like these will most likely fade in the midst of an admirably executed third LP from one of pop-rock’s finest and most accessible artists. People and Things is a praiseworthy continuation of Jack’s Mannequin’s venerable résumé, and there really isn’t a single moment of doubt across the entire album that Andrew McMahon is at the peak of his career. Drawing influences from his work with Something Corporate as well as his personalized experiments with this band, People and Things is an album about already having found yourself, and what to do after that. It explores relationships, marriage, and settling down - which whether it was intended or not - is rather fitting for this record. McMahon has essentially conquered the world of pop oriented alternative rock, and he now finds himself holding down his empire by backing up past conquests with new achievements to brag about. 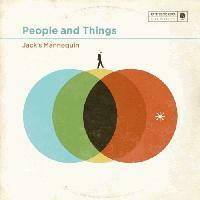 With People and Things, Jack’s Mannequin has solidified its standing right alongside Something Corporate as the second major triumph of McMahon’s musical career. Lovely review, Sowing. Perfect flow. I'll be sure to check this out when I get off work tomorrow morning. hi adam knott how is it going? Hope this is better than The Glass Passenger. AAAAAAAAAAAAAHHHHHHHHHHH *gets wet* *cums pants* This is the album I've waited for all year. Must listen immediately. After reading this review, I'm glad I left it to you Sowing. Bravo. I haven't pos'd a review for far too long, so have one from me. Good review, SS. Didn't really like the album you're gushing about so I don't think I'll check it out. Piano rock....-shudder-, those words frighten me. They make me think of Billy Joel. Turns me off from wanting to check this out. Might give this a listen, normally this guy doesn't do anything for me so no real high hopes. Thanks gyro, davey, xtoxin, xeno, and acanthus! Good review, but I won't let you beat me to 200! My friend asked me what I thought of the album and I replied, "It's a Jack's Mannequin album" and I am pretty sure that summed it up quite well. Good review. I'll probably listen to the album a few times tonight. i liked his first, this is not the direction i would have taken.